We talked last time about Twain and how he was critical of society. What are some topics that he is criticizing in the novel so far? We read Mark Twain’s Adventures of Huckleberry Finn Chapters 20-31 for today. Continuing with our analysis, I want to focus on the character of the characters for today. Let’s come up with a big list of characters from the novel. Huck’s development follows the stages of the Hero’s Journey described my Joseph Campbell. Huck’s journey is one of internal growth and discovery. He goes from the view that slavery was ordained by God to a realization that slavery is wrong and unjust. 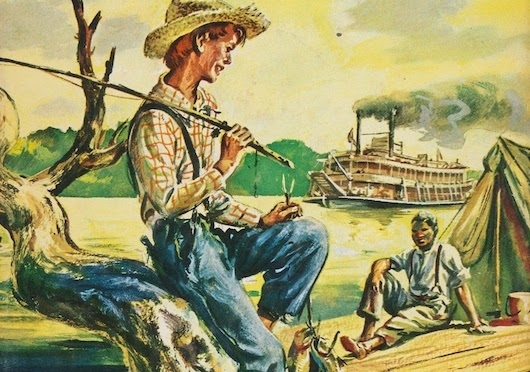 In small groups, trace the development of Huck Finn in the novel following the Hero’s Journey. Focus on where Huck Finn is at the beginning and especially threshold moments/scenes where he changes.